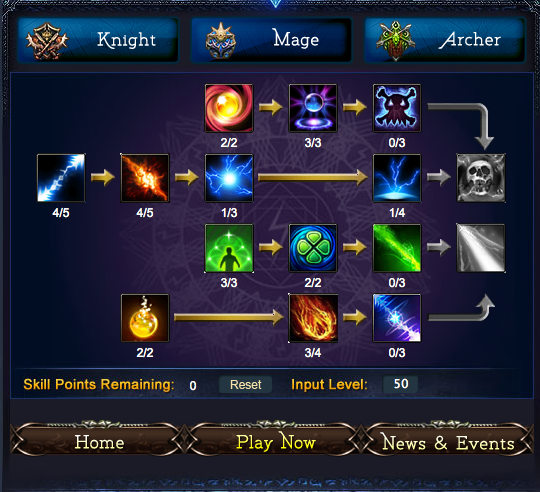 Here are three mage builds. The first is a hybrid build that I would recommend anyone who DOESN'T have double skills use. The build is for a L62; yes, I know you aren't L62 yet, but this shows you what you want to get in the long run. 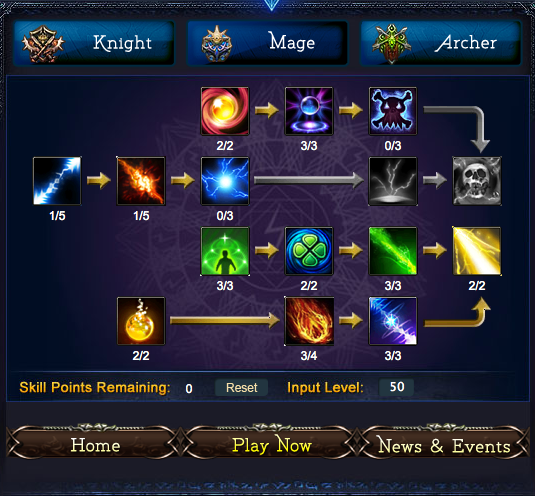 The next two builds are for people who DO have double skills and are L50 builds. Getting Rain of Fire to L4 and Meteoric to L3 gives both a 30% damage boost! This is HUGE! So for damage output it can't be beaten. 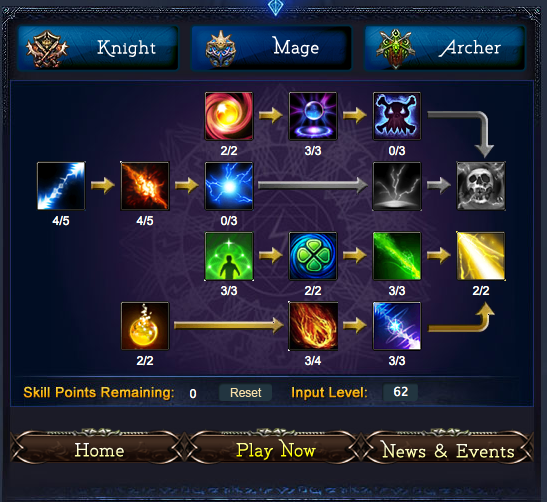 Delphic, Thunderer are primarily useful in Guild Battle and WB, so no real need for either, the other skills are FAR more important. Damnation, while it does 3500-4500 damage at L3 and IGNORES target defense, is not useful at all after 55. It's not even useful from 44-55 (44 is when you can get L3 of it) if you have a high MATK. Unless you have VERY poor MATK, I wouldn't get it at all. If you DO have bad MATK, then it can be very handy in BG/Arena prior to 55. Just don't forget to respec at 55 and get rid of it. Delphic is useful in GB, VERY useful if you can get the rage. (which is hard) Thunderer is what I open against the WB with, it does a LOT of damage but is not terribly useful elsewhere. It's also fun to save up 100 rage against lower level MP bosses and then brutality + 2 Thunderers. From 50 on, level up Delphic and Thunderer. You can also (I did) get L2 Thunderer earlier for the QTE boost. I use full damage ALL THE TIME. The ONLY exception is MP bosses, Cat's bosses and Spire when it opens. I use this build everywhere else. Pretty self-explanatory. From here on I'd get L4 lightning/L4 RoF.